Pens pull away with 3 goals in 3 minutes. Sid and the Pens rolled to another commanding victory against the Leafs fueled by a 3 goal burst in a span of 3:08 in the 2nd period. Crosby's point streak moved up to 17 games, Fleury's win streak advanced to 10 games, and the Pens overall win streak moved up to 11. The Pens got off to a pretty good start with a fundamentally sound 1st period in which they made few defensive mistakes and were able to capitalize on one of Toronto's for the lead. After Chris Kunitz rang one off the goal post, Sidney Crosby followed up the rebound into the same post before finally chipping it in on the 2nd try. Meanwhile, Deryk Engelland and the Pens' defense was also on the top of its game and held the Leafs to just 4 shots in the 1st frame. The entire period led up to the long-awaited rematch of Engelland vs Orr following Eggo's KO of Orr back in October. Though neither man was able to take down his opponent, it is quite obvious that Engelland landed the majority of the punches. Then came the explosion of goals in the 2nd. Pascal Dupuis started things off with a laser breakaway shot following a nice pass from Chris Kunitz. Less than 2 minutes later Mark Letestu would break his scoring drought when he wristed one past Gustavsson for his 5th of the year. But Sid would not be outdone, and he picked up his 2nd of the game about a minute later on another 2 v 1 rush. There would be some hostility brewing near the end of the period which would carry over, but the Pens headed into the locker room with a nearly unreachable 4-0 lead. The Pens came out incredibly flat in the 3rd, and those extra 2 "pad the stats" goals started to look pretty good after Tyler Bozak and Mikhail Grabovski scored to pull the Leafs within 2. Toronto outshot the Pens 15-2 in the 3rd and pretty much owned it until Letestu sniped his 2nd of the game past Gustavsson to get that "all-important" put away goal. There was also quite a bit of ill well between both clubs, and for a while the 3rd got quite chippy. Offense: A- Except for the lackluster 3rd frame, the offensive did quite well as a unit. Defense: A- Fantastic 1st period, good 2nd, not so great 3rd. Fleury: B+ He didn't need to make a whole lot of saves, but got the job done when needed. Powerplay: C+ They were unable to convert, but only had 2 full-length chances. Penalty Kill: B- They gave up yet another PPG, but they did get a shorthander of their own to make up for it. 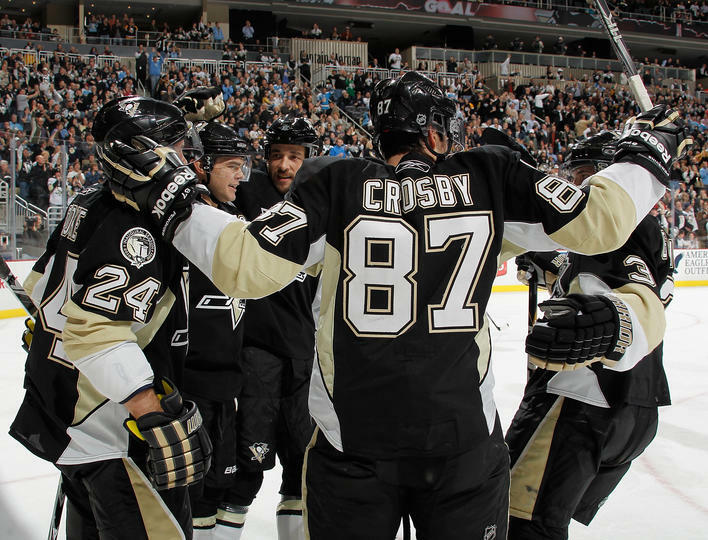 -Chris Kunitz and Pascal Dupuis had yet another phenomenal game on Sid's wing. They are both playing the best hockey of their careers right now. -3rd line clicking again. Great to see Letestu pick up a well-deserved pair of goals, while TK and Conner also got up on the board with assists. -Probably Paul Martin's best defensive performance of the season. Paul finished the game with a +3 rating after making countless solid plays.